Israeli soldiers shot and killed, on Friday at night, a young Palestinian named Ali Mohammad Sa’id Abu Ghannam, 16 years of age, near the Zaim military roadblock, east of occupied Jerusalem.The Palestinian News & Info Agency WAFA has reported that the soldiers stopped the Palestinian, who was walking with a young woman from his family, and started provoking the two, before the soldiers uttered vulgar words towards the young woman. The incident caused the young man to engage in a scuffle with the soldiers before one of them shot him dead. 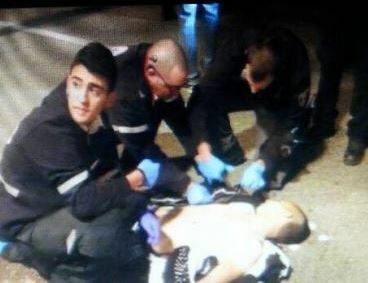 The army is alleging the Palestinian “attempted to stab a soldier,’ and was shot dead while trying to flee the scene. The name of the slain Palestinian is Ali Mohammad Abu Ghannam, 16 years of age. The Israeli army refused to hand the body of the slain Palestinian to the Red Crescent ambulance that arrived on the scene, and took it to an unknown destination. The Ynet News quoted a police statement alleging that one of the soldiers managed to hold the Palestinian, “but he continued to run towards the soldiers,” and they shot him dead. In related news, Palestinian medical sources have reported that two Palestinians were shot and injured, on Friday, after Israeli soldiers opened fire on Palestinians east of Abasan town, east of the southern Gaza Strip city of Khan Younis. One of the wounded was moved to Nasser Hospital in Khan Younis, suffering a gunshot injury, while the second received treatment by local medics after being shot with a rubber-coated metal bullet.